As you know, Mike and I do love our pizza, and he makes it at home often. He’s been working on refining the dough recipe for his pizza stone version, weighing the finished dough and pinching off 7 to 8 ounces of it so the crust fits our peel better, and that has left us with a freezer full of little dough balls. Since opening the freezer door has become a bit of a hazard lately, what with the frozen dough and other items crammed inside often shifting and plummeting south toward unsuspecting toes, I decided to take action: I’d thaw some of those balls of dough and turn them into calzones. I took two nice bunches of farmers’ market greens (one kale and one mustard, but any type of greens would probably work well here), stemmed and chopped them, and cooked them down with a good amount of olive oil and smashed garlic. When they were nicely wilted down but still bright green, I removed them from the heat and let them cool. I tipped a container of Narragansett Creamery ricotta into a big bowl, then added some salt, freshly ground pepper, an egg yolk, and a bit of grated parm, then mixed it all to combine. When my greens were cool enough to handle, I ran my knife through them again to chop them really fine, then squeezed out the excess liquid and added them to the cheese mix, stirring until the greens were evenly distributed. I made a bit of a mess with the dough at first – it was a little wet and kept sticking to my parchment, so I had to incorporate a bit more flour into it (getting it all over the counter, the floor, and myself in the process), but I finally got a couple of rounds I could work with. I mounded a big scoop of the filling on half of each round, folded them over, crimped the edges, brushed them with a bit of beaten egg white, cut a few slashes in the tops to help them vent steam, then I placed them on the pizza stone in a preheated 450 degree oven for about half an hour. 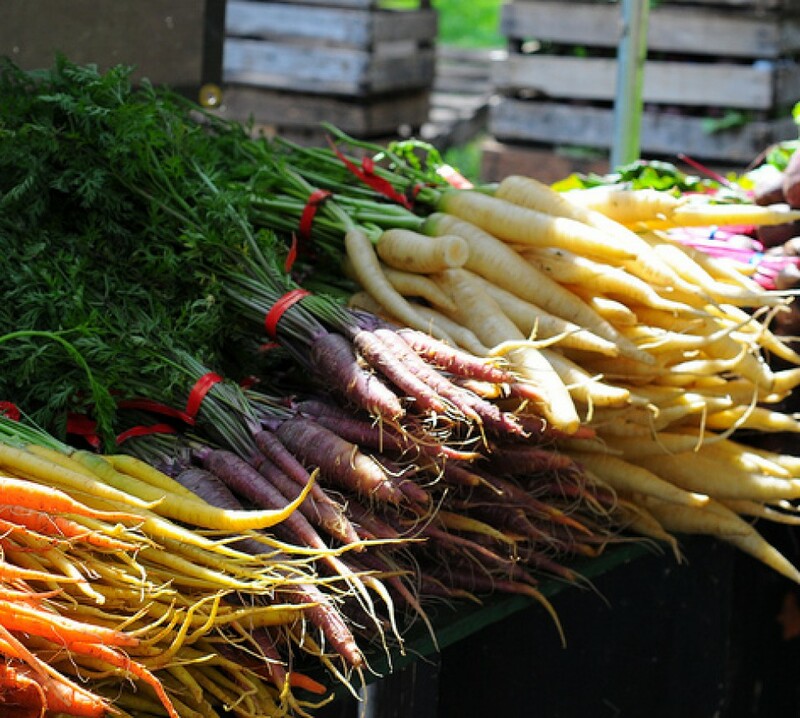 I served them up with a rich, winey tomato sauce (which also ended up all over me as I cooked it – not my finest hour in the kitchen that night), and some lightly dressed Arcadian Fields Teenage Lettuce Mix. My calzones are a work in progress, but I think we got off to a great start. Yum, yum, YUM! That looks ab fab. I should say so! 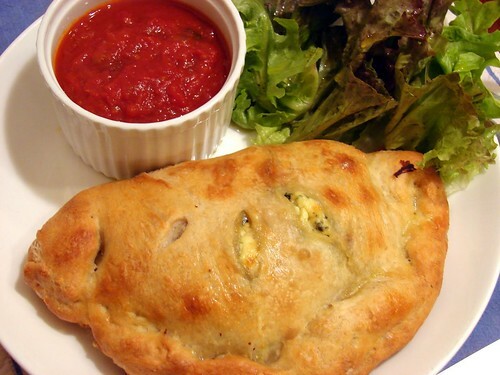 If you add a little mozzarella, the strings will drape between the calzone and your mouth. That is a good thing. 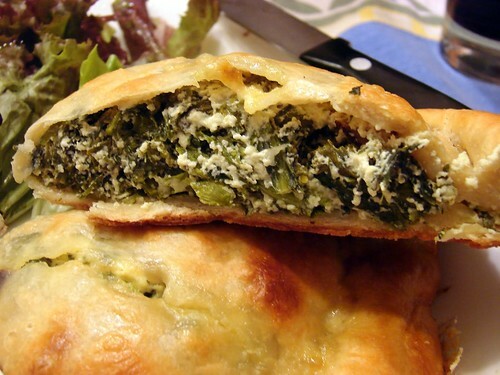 Gorgeous — a cross between a calzone and a spanikopita! That Narragansett Creamery cheese is fabulous, isn’t it? I use it all the time. Looks lovely! I’m thinking of making this for a friend with a new baby, and wanted to give her some for the freezer as well. Do you think it would freeze okay? Post- or pre-baking? Looks great! 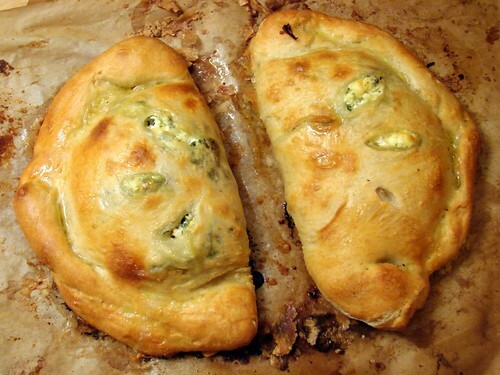 I’ve been craving calzones lately, and these look delicious. Thanks, all! I’m looking forward to playing with calzones again soon – stay tuned!